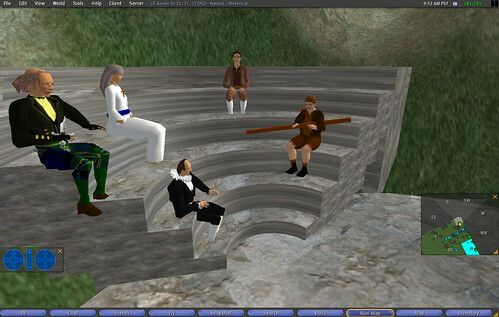 April 15 at 6SLT I will be leading an interactive discussion about the use of role-playing for learning in Second Life at ALA Island . During the event we will participate in a role-playing activity so I ask that attendees come dressed as a favorite historical figure. We won’t be judging the avatars so homemade, default, slider-type avatars will be fine. This is a learning experience so please don’t feel the need to purchase a new avatar and by all means don’t be embarrassed if your avatar doesn’t look as good as you like. As you will see, role-play is more about being able to “play” the role rather than looking the part. I think this will be a fun event and will get us (educators in SL) away from the typical slide show and lecture format that currently dominates educational events in SL. At the event, ALA Tech Source will have a Chapter of “Virtual Worlds: Ideas, Challenges and Innovations” available for free! ALA TechSource is proud to present our first virtual world event—a discussion of virtual worlds, libraries and education with Second Life expert Joe Sanchez. Sanchez, a doctoral candidate at the University of Texas, is the author of February’s issue of Library Technology Reports, “Virtual Worlds: Ideas, Challenges and Innovations”. Please join us on the ALA Island on Wednesday, April 15 at 6:00pm SLT for an exclusive interactive discussion and presentation of his work. We’ll be discussing virtual worlds and their potential to impact library service and freedom of information, as well as Joe’s work with LIS students using Second Life. One of the topics discussed will be role-playing in virtual worlds, so we are asking all participants to come dressed as their favorite historical figure!